A warm welcome and I hope you enjoy browsing through the pages of this website. You may have already noticed my short tag line is ‘Coaching to success’. It means that I help and support people to make positive choices and changes to their lives. You may be surprised that I am not all about the ‘high fives’, the big motivational events and the ‘change your life in 24 hours’ mantras. You may be surprised to know that I live in the same world as the people I work with. I experience the same emotions such as happiness, sadness, fear, grief. Living a rich and meaningful life means experiencing a range of emotions. How we manage the emotions we experience makes a big difference in how we move forward. In my life, I have experienced failure. I was asked to leave school at 16. Released by professional football team at 19. Left my first venture into the world of sales after just 3 weeks. Had ‘demo tapes’ rejected by over 50 radio stations when I was aiming to secure a portion as a radio presenter. In one business venture, I lost a significant amount of money when 3 companies I was working with went into liquidation. Just like emotions as we go through life things will not always go the way we want them to go. It is what we learn from the ‘failures’ that make the difference. Enjoyed a successful career in Sales and Marketing. Project Managed a National Change Program. Present on two radio stations. 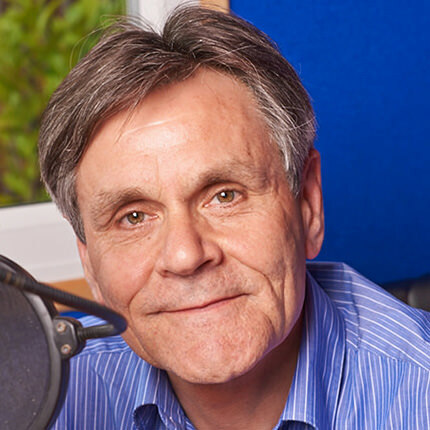 Produce and present The Be Happy – Be Inspired and Business Hour Podcast. Enjoy a great family life experiencing all the things that go with that. One evening whilst doing a talk in York a member of the audience said these words. ‘It is alright for you Mr. Positive you don’t live in the real world’. From what I have described you can see that I do live in the real world. The difference between me and the person who asked that question is that we choose to deal with the challenges of life in a different way. My purpose is simply to help you make the changes you would like to make and be the person you really want to be. Enjoy the website and when the timing is right for you. I look forward to working with you or meeting you at an event. Make the most of each moment and have the best day you possibly can. I look forward to helping you make a positive change and live the life you really want. A big thank you for taking a look at my website if you are looking to live an inspired life you are in the right place. Live your life with passion.